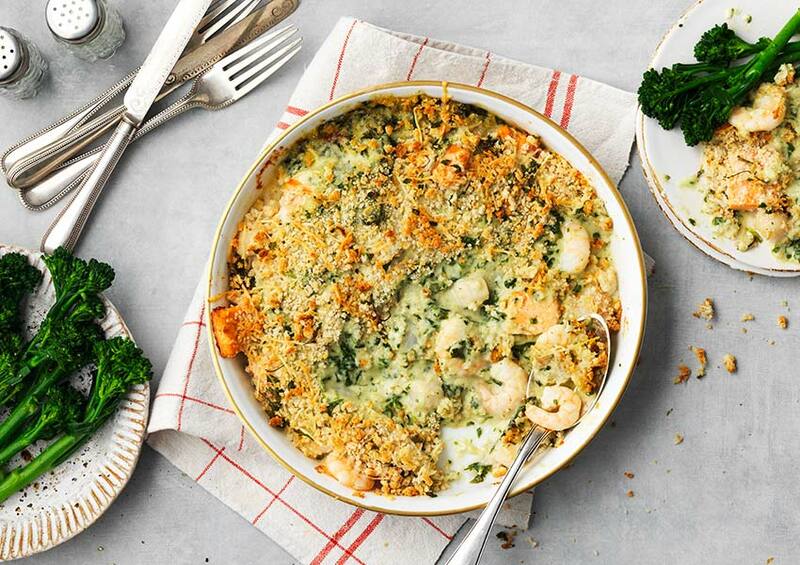 When you’re short on time but still want to impress, this oven ready seafood gratin with a sophisticated Prosecco, tarragon and dill sauce is just the thing. Salmon (Salmo salar)(Fish) (25%), Double Cream (Cows' Milk), King Prawn (Penaeus vannamei)(Crustacean) (14%) (King Prawn (Penaeus vannamei) (Crustacean), Salt), Spinach (6%), Breadcrumb (Fortified Wheat Flour (Wheat Flour, Calcium Carbonate, Iron, Niacin, Thiamin), Yeast, Salt, Cider Vinegar, Wheat Flour, Starter Culture), Queen Scallop (Aequipecten opercularis) (Mollusc) (5%), Water, Shallots, Fennel, Prosecco (Sulphites) (3%), White Wine (Sulphites) (3%), Gruyère Cheese (Cows' Milk) (3%), Fortified Wheat Flour (Wheat Flour, Calcium Carbonate, Iron, Niacin, Thiamin), Butter (Cows' Milk), Parsley, Salt, Fish Powder, Chicory Extract, Dill, Yeast Extract, Onion, Tarragon, Rapeseed Oil, Celeriac (Celery), Thyme, Leek, Carrot, White Pepper, Bay Extract. Although every care has been taken to remove all bones and shells, some may remain. Produced in the UK using farmed Scottish salmon, prawns farmed in Belize, Thailand and Vietnam and queen scallops caught by dredge in the N.E. Atlantic (Irish Sea, North Sea and West of Scotland).